The DigiMax D8 is an 8 channel preamplifier featuring 8 award-winning class A XMAX mic preamps with 24-bit ADAT digital output. 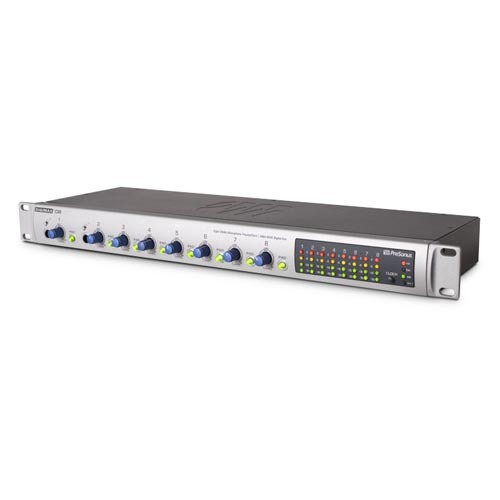 All eight preamps include variable trim control, 48V phantom power, ultra-fast acting LED metering and 20 dB pad. In addition, 2 instrument inputs are located on the front panel for direct Hi-Z instrument input. Balanced TRS direct analog outputs are located on the rear panel for routing and flexibility. The DigiMax D8 also includes word clock sync input for ultra-low jitter and robust synchronization.